The sun set spectacularly as it tends to do over calm, turquoise waters. The town feels slightly outdated, forgotten, maybe a little contrived. 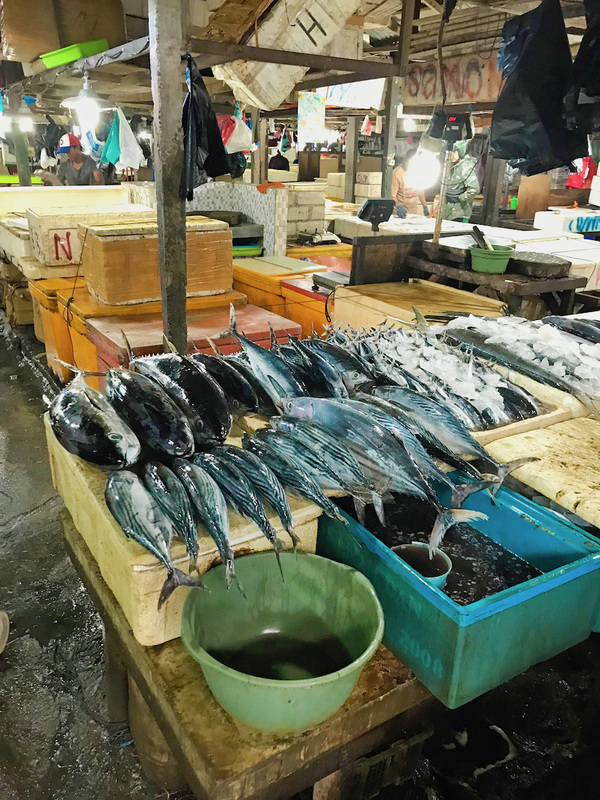 Our hotel sits on a dirt road running directly between the Kedonganan fish market and the airport. 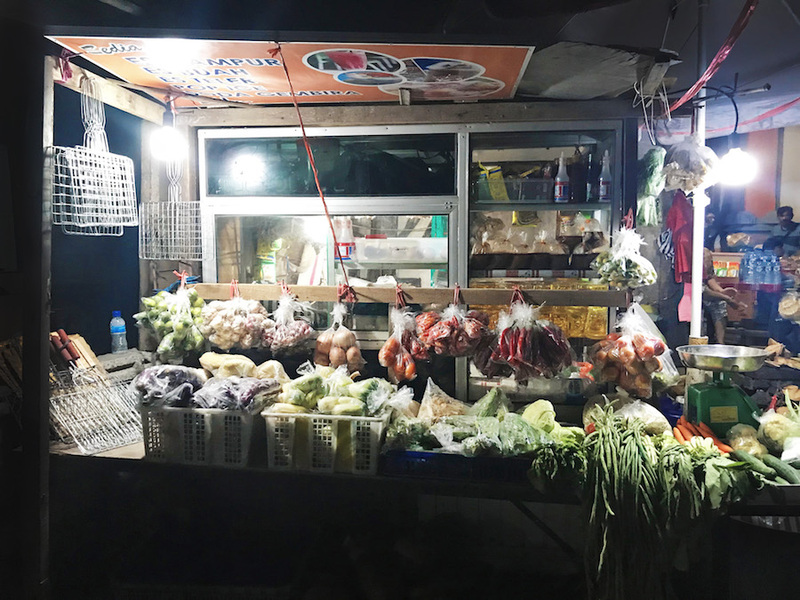 We intentionally positioned ourselves in a part of town with easy access to the market. A convenient feature for late night and early morning motorbike rides to the loading docks, but a rather pungent deterrent for much else. Our room makes up for what it lacks in cleanliness and amenities with ample space, questionably cheap prices, and a location that teeters between abysmal and ideal. The obligatory lizard slithers around the bathroom and a few roaches curl on their backs near the doorways. Common sightings in most inexpensive accommodations. Indonesia has a way of providing an uncomfortably close look at nature — among other curious things. Night falls on the town and the heartbeat quickly changes. Streets clear, lights dim, and a different crowd of people emerge. The first night in a foreign place typically comes with distorted and oversaturated views of the surroundings. Each setting carries a palpable intensity, the colors more vibrant, the streets dauntingly unfamiliar, the moments longer. 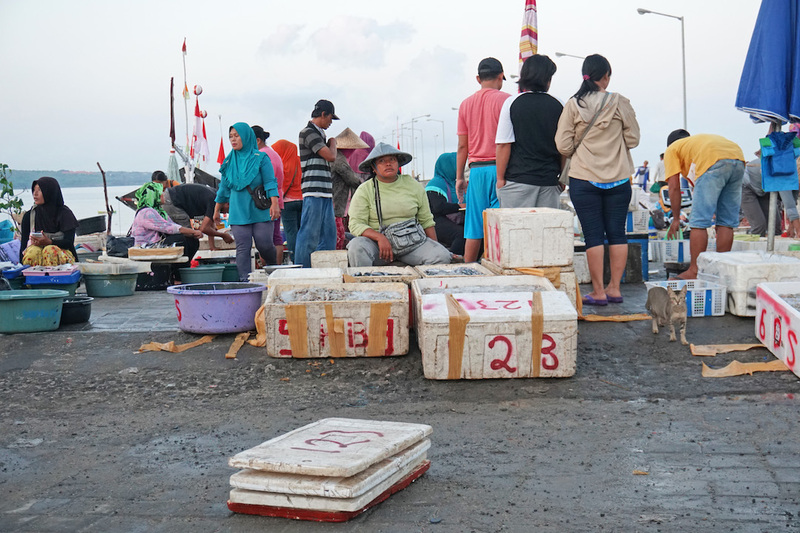 We arrived at the Kedonganan fish market late that evening. The city had already shifted, the market lights failing to illuminate any sense of familiarity. My first thought, is we don’t belong here. The street leading to the market was nearly pitch-black. A few small stands sold wilted piles of leafy greens, herbs, and a bizarre assortment of convenience items all backlit in a foggy, fluorescent yellow. Halos of light broke the darkness every few feet, glowing and buzzing in the humid air. The tires of our rented motorbike kicked up gravel and splashed through thick mud from the incessant late night rains this time of year. “I don’t see it. We’re almost at the water.“ Aaron said with his head turned slightly sideways, still keeping an eye on the unfamiliar road. The call to prayer reverberates in the background, an audible reminder that we are on foreign ground. The map in my head placed the fish market at the end of our road, right next to the rear gate of the Kuta airport. I hadn’t studied the map much further. The desolate streets and my burgeoning nerves made me hope I wasn’t I wrong. “Let’s turn here and see where it takes us.” Aaron pulled our bike left down a narrow, dirt alley. Before my unnecessary, yet involuntary, concern with dark alleys in foreign places could render into words, our bike came to a halt. A short, uninviting building sat to my left, another directly to my right – the front and rear structures of the fish market. 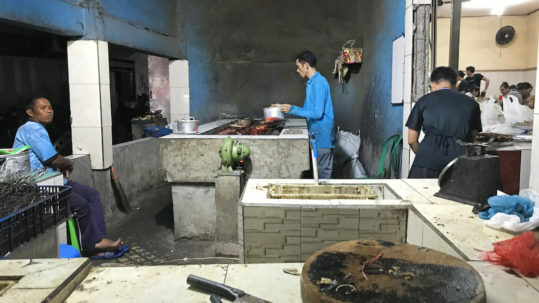 Small warungs, or local restaurants, line both sides of the street offering plastic lawn tables and a place to grill fresh seafood. A quick lap around the area leads us to a string of copycat cafes on the beachfront. Each cafe adorned with its own cheesy neon sign illuminating the gimmicky facades and massive, cloudy fish tanks luring diners to catch their own dinner. Rear decks hang from the back of each restaurant with now-useless views of the black ocean. We turn our scooter around and drive back to the market. The smell of salt water, fish, and damp earth hang stagnant in the night air. We make our way through a small cutout on the rear wall of the main building and into the heart of the market. My feet hit the cracked cement floor and displace a trickling stream of liquid. 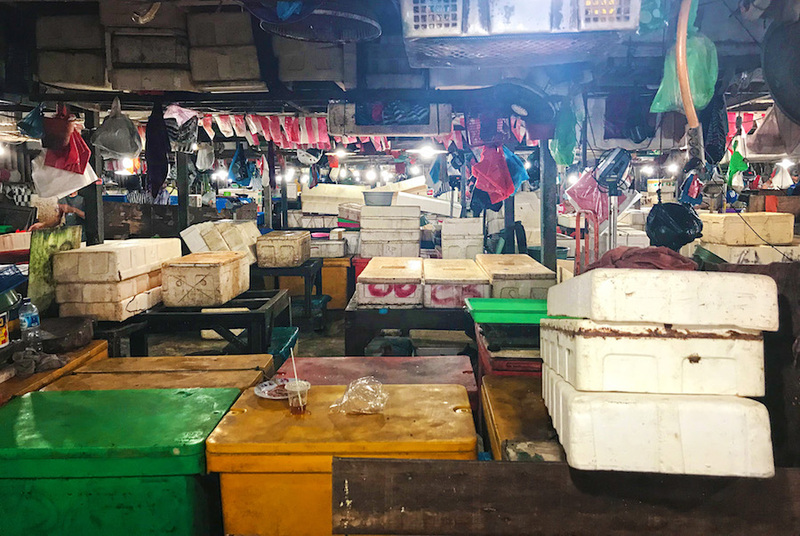 Disheveled rows of eager vendors hawk styrofoam coolers full of anything and everything caught in local waters. A pile of bright blue lobsters catch my eye. The color is magnificently distracting in the muted setting. The woman behind the table quickly grabs a hefty lobster and places it on one side of the archaic metal scale in front of her. Eager to make a late-night sale, she immediately starts bargaining. She stands in a floor length chiffon dress, draped in jewels, as her waterlogged hands set lead weights on the opposite side of the scale. She quickly auctions off prices in Balinese. 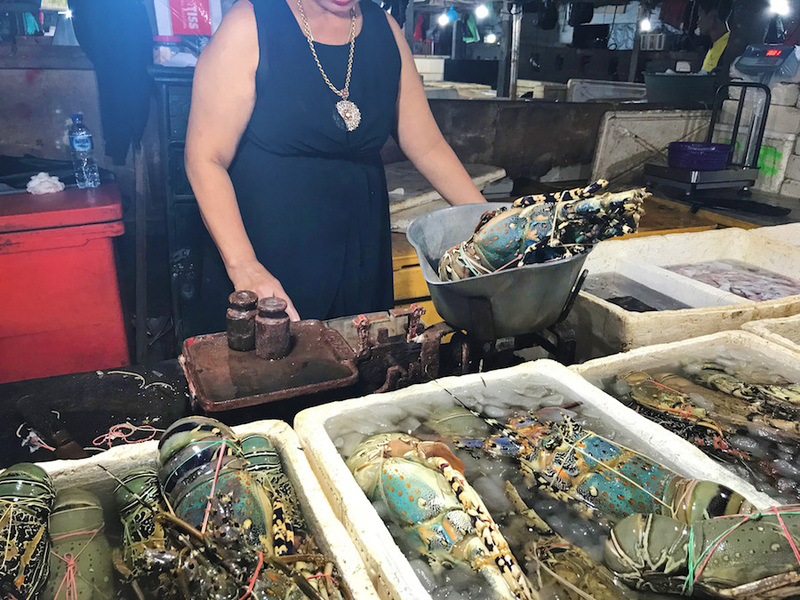 Despite the temptation to feast on one of the most reasonably priced and technicolor crustaceans we’d ever laid eyes on, we decide to forgo seafood and spring for a nightcap. 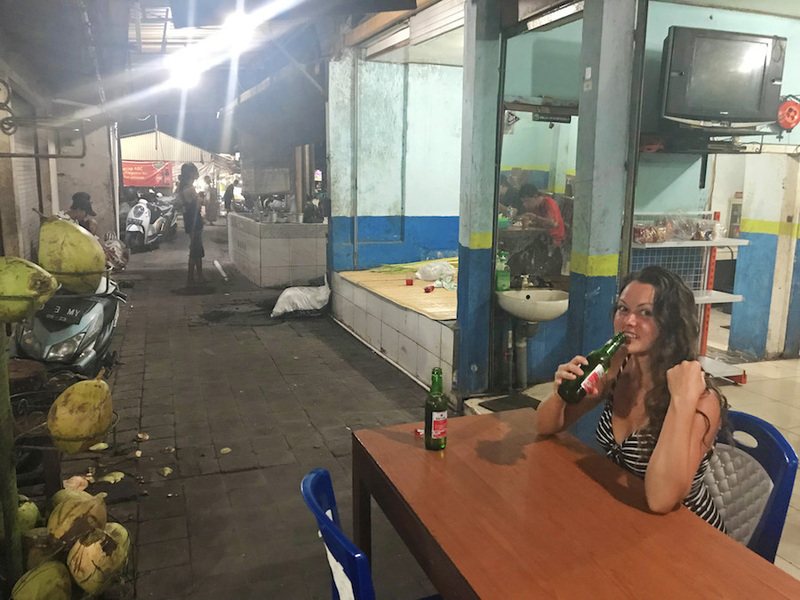 A few feet from the market sits a breezy warung with a large crowd and good lighting. A plastic table is open and inviting right by the front door, a prime location for people watching and trying to decipher the laid-back rhythm of this place. Aaron grabs the least warm Bintang from the beer cooler and cheerfully brings it back to the table for us to share. Locals and tourists alike bring their inexpensive and freshly caught finds to the large kitchen window. A man takes the bag, weighs the contents, and quotes a price. Then, in methodical succession, the fish is cleaned, prepared, and grilled, all directly in front of us. Eventually a woman offers the plated feast with a shout into the dining area. This scene plays on repeat as we indulge in another Bintang. A rare behind-the-scenes. Sitting nose-deep in a real life documentary staring local fisherman, late-night cooks, and people that purchase entire lobsters after 9PM. I sit in a red plastic lawn chair, sipping on the cheapest beer of the trip, intently watching each scene as cracking crab shells and lively conversation composes a distinct soundtrack in the background. Lizards and overfed rats scurry behind stacks of empty beer bottles along the wall. A few slightly more athletic rats run across the open rafters of the ceiling. Nobody seems to notice, or care, and I realize I don’t either. The past five weeks in Indonesia has provided ample encounters with rodents, spiders, bats, aggressive monkeys, stomach ailments, and dirt floor cafes. Somewhere along the journey, these things started to blend in. 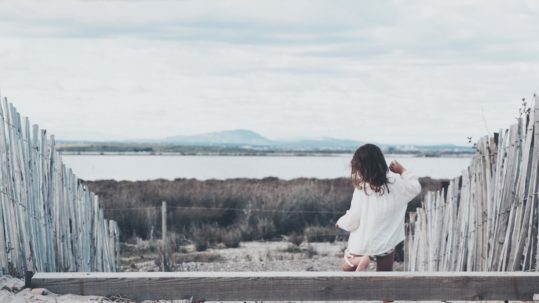 I grew comfortable with the simplicity, the lack of rules and infrastructure, and the ease of these situations. 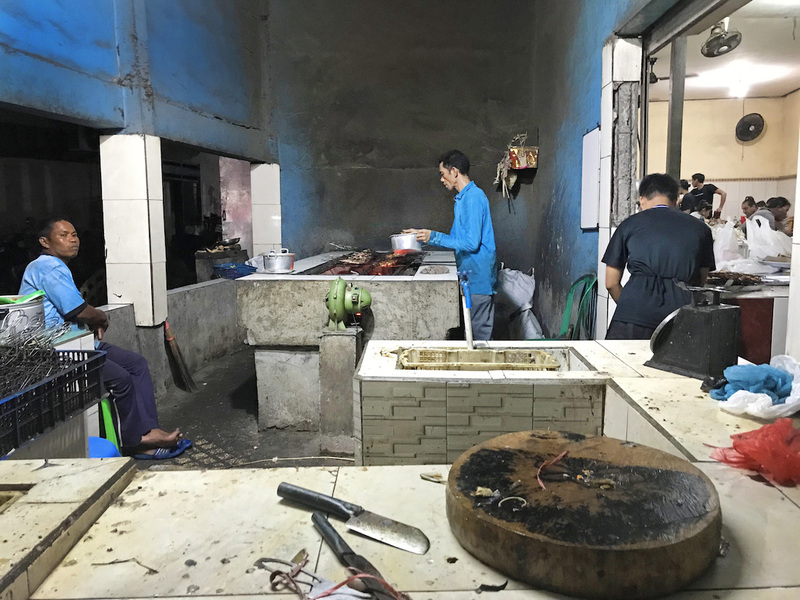 Nevertheless, as comfortable as one can be in poorly-lit back alleys of a fish market – there is always that slight feeling of not belonging. A voyeuristic tinge that feels both exciting and imposing. I remember feeling alone in the busiest of places, like someone might ask us to leave because we didn’t quite fit in. We were foreign in a local’s place. The alarm on my phone blared at 5AM the next morning, echoing in our nearly empty room. With eyes still closed, I tried to force myself awake. My first thought: where am I? My eyes shot open and I sat up to inspect the room. The faded grey walls, the bedspread… it slowly came to me. Jimbaran. Waking up in new beds in new cities every two days for the last five weeks really wore down life’s level of predictability. Never really feeling settled or spending enough time in any one place to let your guard down. Each morning played out like a rerun of a bad sitcom. Who’s bed am I in? What country am I in? What did I do last night? The sun was barely awake, just as dull and tired as I was. “20 more minutes?” I asked Aaron knowing his eyes were still pressed shut. When we finally rolled out of bed at 5:24 we proceeded to our daily routine of brushing our teeth with leftover bottled water and throwing on the lightest and breeziest clothes we could find, usually what we wore the night before. We did this with a level of skill and a sense of urgency that could please any drill sergeant. Our feet hit the dirt parking lot and we were on our bike headed down the street four minutes later. This time, the narrow alley was lit with early morning sunshine and the warehouses must have lost their eerie glow overnight. 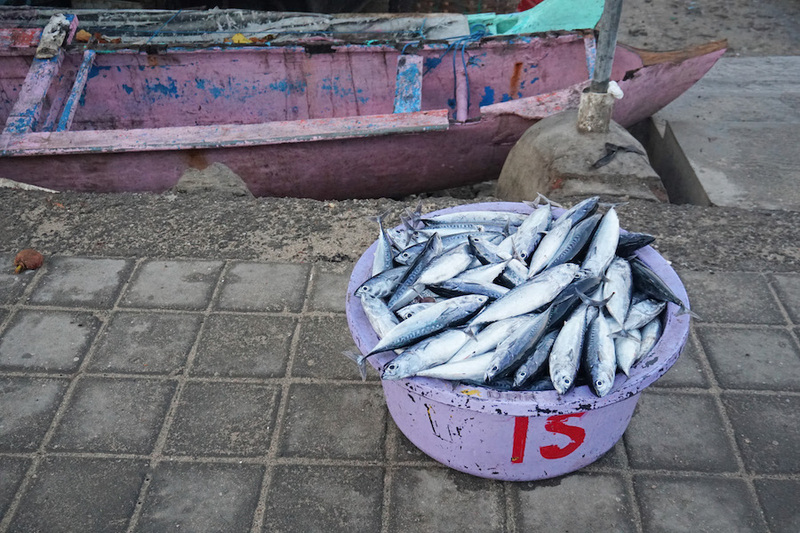 Making it to the Kendongan Fish market at sunrise is a daunting challenge but one that’s continuously recommended. 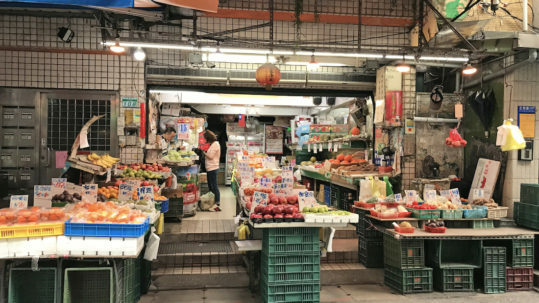 This local market is known for its early morning cadence. Wooden boats dock on the shore while local fisherman unload buckets and boxes of freshly caught, still crawling and squirming sea-life. 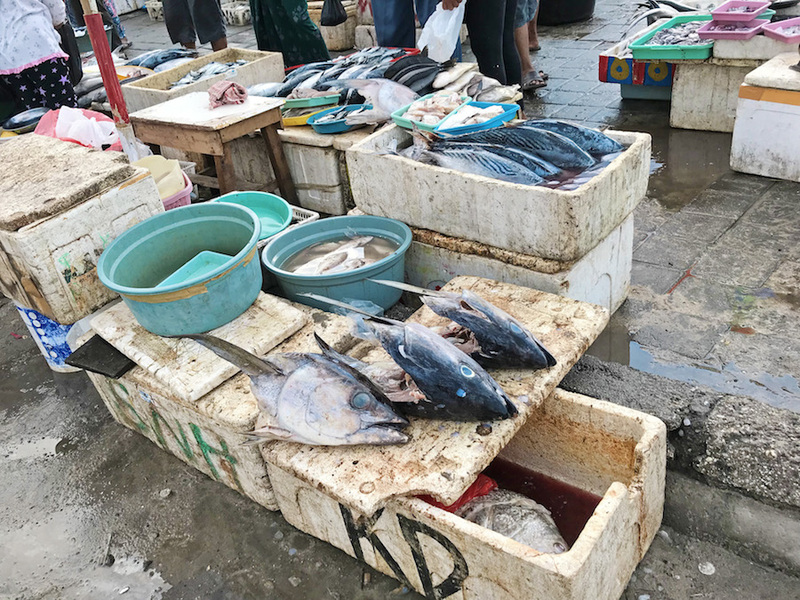 Women count and organize the catch into Styrofoam coolers, local restauranteurs select and gather fresh catch for their daily menus, and tourists like us flock to witness it all. 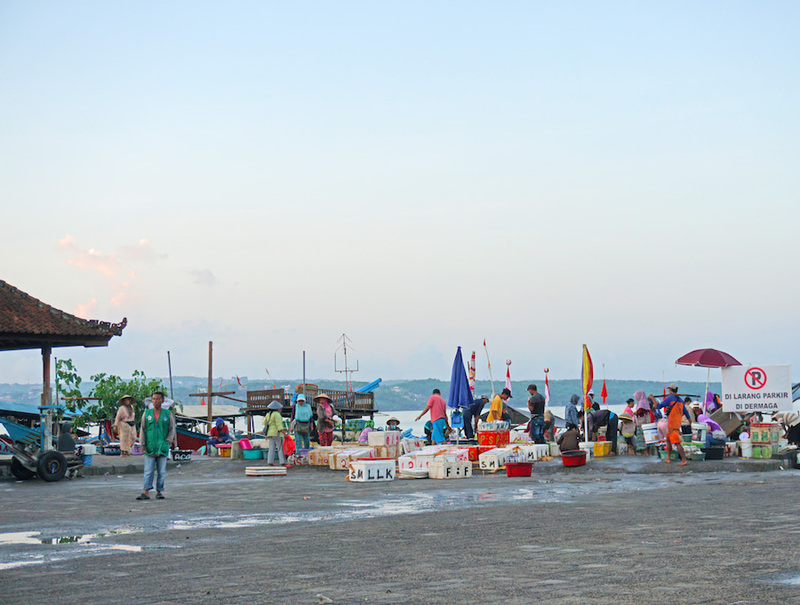 The Kedonganan Fish Market marvelously blends two visibly different places. At night, a buzzy and fluorescent outdoor playground for intrepid tourists and hungry locals. During the day, a well-lit place of order, efficiency, and business. One of those rare places that allows you to choose your own adventure – to make it what you want. 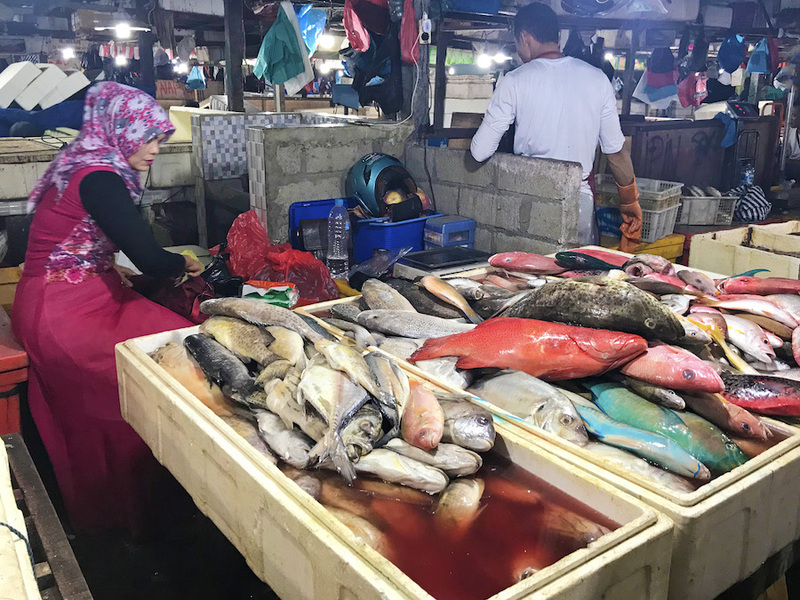 Come as a tourist, dine at copycat cafes, take an organized tour through the fish market, stay at the Intercontinental Hotel on the main road, and maintain a level of comfort among the chaos. 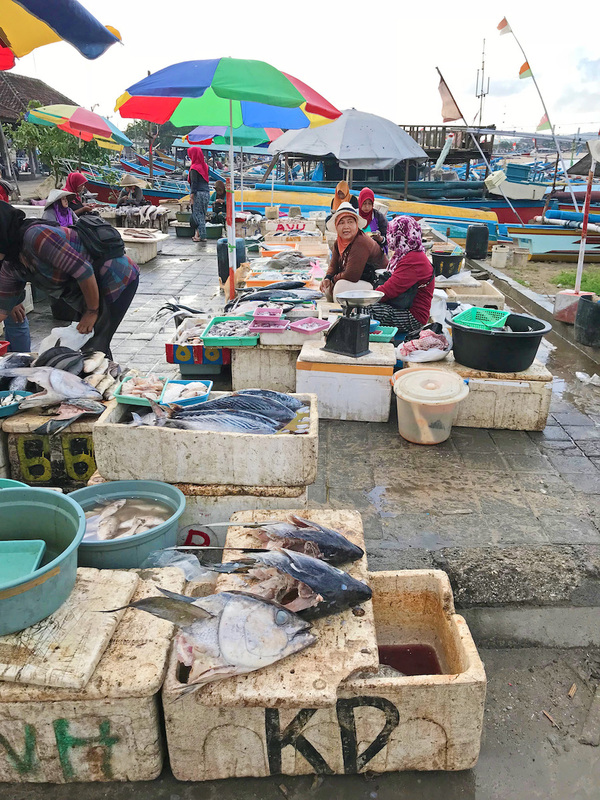 Contrarily, you can homestay in a modest house walking distance to the ocean or perch at the local hostel, eat from dirt-floor and open-air warungs, and dodge busy fisherman as you attempt to untangle the routes between boat and bustling vendor at 5:28 in the morning. 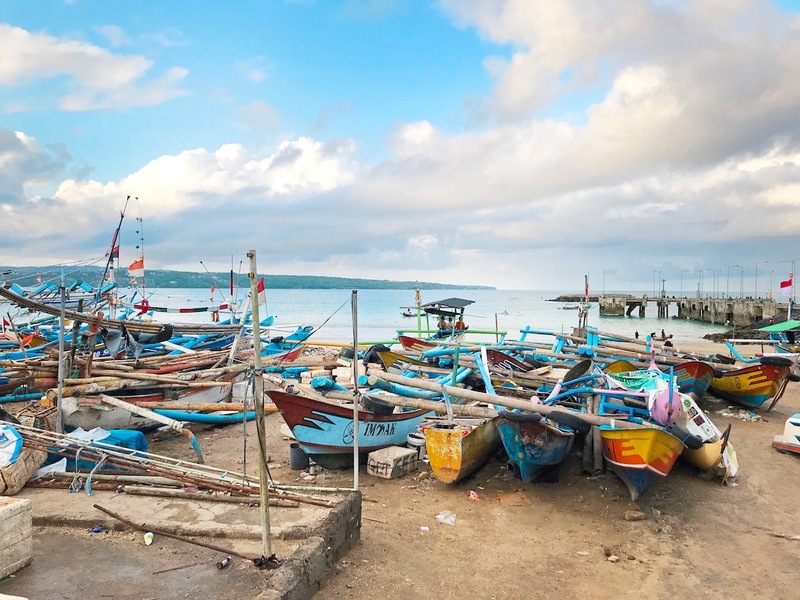 However you decide to capture Kedonganan, make sure you do so with a brazen spirit and a hunger for colorful displays of culture and freshly caught seafood. so well written, I love going on trips through your stories. Thanks for letting me tag along!